Avocados Or 5 Dollar Bill? 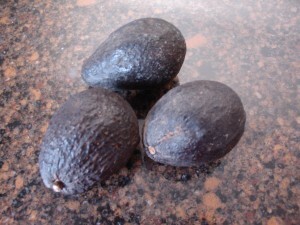 I was cleaning up the kitchen the other day when I saw three avocados sitting on the counter, drying up before my very eyes. As I glanced down, I didn’t think of them as avocados anymore. Instead, I saw them as a five dollar bill that was going to be thrown out. That image really frustrated me. So many times I have cleaned out the fridge and thrown out old cucumbers and expired yogurt. However, I never really thought about the food in terms of an exact dollar amount. In this case, I remembered that those avocados were purchased at the price of 3 for 5 dollars. Therefore, it was easy to visualize tossing money literally into the garbage when I saw the fruit was no longer usable. Calculate the amount of money wasted next time you clean out the refrigerator. I am not telling you to deduct a fraction of the price of leftover sour cream sitting at the bottom of the container. However, if a bag of apples goes bad, don’t just toss it. Visualize reaching into your wallet, taking out three dollars, and tossing that money right into the trash. Perhaps if you truly associate money with what you are throwing out, it will teach you to go through the refrigerator every day or so and try using up what may soon spoil or expire. This exercise may also make you think twice before you spend on an item in the first place. What is the most expensive item you have had to throw out because it was no longer edible? Do you end up throwing out much food each week? I really do make a conscious effort to go through our fridge once a week. I hate wasting food/money. I also try to bake/throw something together if something is close to the verge. That means a lot of apple cakes or orange bread, but really is that a bad thing? Once my parents’ dog got a fully prepared pork roast. There was much sadness. I totally see avocados as guacamole as it is one of my favorite foods. However, I cannot stand when avocados are too mushy and brown inside. Sad cucumbers can be very scary. It is amazing how they turn into water. Slimy, mushy, green water. perhaps you have family members who aren’t so picky? Even if they’re no good for guac any more you could try mixing it in with rice and beans – it gives them a really creamy texture. I wish avocados were cheaper – I’d eat them every day if I could. We’re bad about going through the fridge on a regular basis but we’re pretty good about not letting things go to waste and salvaging what we can. MBA- that is a good idea to mix with rice and beans, I have never done that before. I will have to go look for a recipe. I’d have to say that I hate this about as much as you do. Composting helps ease my fears ,but I still dont want to pay $5 for worm food. I don’t know if you can compost an avocado with that giant pit and all. My kids just made a compost bin this past weekend. I am learning, and it is kind of rewarding to put things in the bin instead of the garbage! Kris, that’s actually an excellent tip! As a nation, we waste a lot of food! Visualizing money being thrown out is a good way to keep a tab on waste. I hate wasting food so much. I hate even more when I buy fruit and don’t notice there are moldy raspberries on the bottom or whatever, then I feel totally ripped off. I am truly going to try and be better at this. Seeing that wasted five dollars really got to me. Since my wife prepares weekly menus, we avoid a lot of waste. We also use leftovers for lunches which is economical and avoids waste. BTW, the avocados could be used for guacamole! Yum! I nearly cried when we threw out a whole, forgotten bag of grapes once…they were about $5-$7 and got hidden behind the pickles or something. I would estimate that we throw out at least $15 of food a month, which is actually (and sadly) a huge improvement over last year…. Oh yikes, grapes are so expensive, I probably would have cried. Or maybe I would have stomped all over them and made some wine, even though I hate wine. I feel your pain. I sometimes even overreact to waste. But-in the scope of things, mistakes happen, and no one is perfect! Sometimes you gotta throw things out and move on! Barb, life has gotten too busy and I have thrown away too many things. My recent lack of organization is getting costly. This weekend, I am implementing my plan to not waste (much) anymore! Then I will move on! You’re so right about looking at wasted food as money down the drain. I think everybody wastes some food, and it’s an area that can be a decent savings category for people who diligently refocus on it. Instead of people spending hours making their own paper towels or whatever, maybe just actually eating what we buy is an easier way to save? Good point about the paper towels Squirrel. I am excited about my new plan to pay closer attention to my food. I’m with you one hundred and one percent on this one. Throwing away food is one of my all-time pet peeves. So wasteful, and so unnecessary. and unfortunately, I have been so busy that things have gotten disorganized and I throw out more things than I should. I am putting a stop to that now. My avocados really taught me a lesson. I have to admit I’m not as sharp on pantry management as I should be, but oh well! It was actually not much of a problem when my kids were home – food just disappeared, no problem. Yikes, my pantry is another story altogether. I just had to throw away a couple boxes of cereal just the other day. My goal this weekend is to clean the pantry out and also practice better pantry management. Very good tip. This is how I got babci to stop buying extra food for my family that we couldn’t eat. I attempted to throw a $20 bill out the window of my car while she was in it. She thought I was insane but that really is what happens every week if you buy more than you need. I don’t have that much food go bad anymore now that I have 2 kids. They are like little eating machines. If I had a $1 for every time I heard them say “I’M HUNGRY” I’d be rich. Kids are always hungry for easy things like Goldfish. However, if they have to slice a cucumber or something, then there is ‘nothing to eat around here’. Of course, yours are too little to use knives, but just making a generic statement. Yeah, we sometimes offer them fruit that they’re not in the mood for (they’ll always take berries or citrus, but sometimes turn their nose up at bananas or apples.). They say, no, I’m hungry for something different..then we say, I guess you’re not hungry then. Then I get the FINE I’LL TAKE THE STINKIN BANANA. We definitely are on the same wavelength. It’s a little scary sometimes. But I do admit I am guilty of wasting food. I buy stuff with the full intention of eating healthier the coming week and end up eating the same old stuff – plus with all dried up vegetables. I have to get better. I think I am doing much better now, but I could def. improve. I am good with pantry though. Suba, I do the same thing. I will be shopping and think “oh this will be really good for me”. Then it ends up sitting there, just waiting to be used. Now that it is summer though, we won’t be throwing out much food since all 3 kids will be home all day. Trust me, the avocados were not usable. CPR could not have saved them. I’m sure you can still make guacamole with those avocados! We threw out milk before we had kids, but now, I end up running out usually. Did you plant lettuce? It has been an odd spring. It has been either pouring or drought it seems. Yeah. It’s been raining non stop or 70+ degrees out. My lettuce can’t take the manic weather. We grocery shop once a week to force us to eat whats in the house. If we forget things at the store, we do without them so we don’t pick up anything extra on accident. If we run out of something, it means we eat something else in the house that we already have. I should pretend I can’t go to the store, unless I need milk, bread or eggs! I am often shocked at stores that try to even see those mushy, dried up old avocados! I was cleaning up the kitchen the other day when I saw three avocados sitting on the counter, drying up before my very eyes.As I glanced down, I didn’t think of them as avocados anymore. Instead, I saw them as a five dollar bill that was going to be thrown out.